Conservatories don’t always have the best reputation. They’re too often seen as a box bolted onto the back of a house, when for them to deliver what you want them to deliver, it takes a lot more thought and planning. The other reason that conservatories won’t always immediately jump to the top of the list for those looking for extra space, is that if you have lived in a house with an older conservatory, they aren’t always the most comfortable spaces. Old polycarbonate roofs or single glazing can make them unbearably hot in summer and cold in winter. But that’s what you thought you knew about conservatories. Things have moved on beyond recognition and we’re pleased to say things have changed. In part driven by technical innovation and in part driven by demand from families for comfortable year round living space, the conservatory manufacturers have created a new generation of conservatories, orangeries, conservatory hybrid products; sun rooms and glazed extensions. Have a look at some of these designs at Premier Windows Conservatories or Premier Windows Extensions & Orangeries. These exploit new innovations in glass which deliver ever higher levels of energy efficiency, keeping heat in in winter. Solar reflective glass reverses the effect in summer to deflect heat gain from the sun. Glass is even self-cleaning. This puts a tick in the box against performance. But design is critical and in glazed extensions it’s now about anything but the ‘box’. This is where as an industry we have seen the greatest level of innovation. Glazed extensions and conservatories are available in a wealth of different designs, from contemporary to the classic. But one of the most popular that we are seeing is for hybrid-type products which are built around a conservatory frame but feature brick-work pillars and internal boxing to create a much more substantial feel. A good example is the LivinRoom. This adds an internal steel work ladder system to the eaves and glazing bar positions of a classic glazed roof. This is the foundation for a screwed to steel plasterboard framework, which forms the basis of a ‘traditional’ internal plaster ‘soffit’ perimeter ceiling. It’s a great way of adding very flexible extra living space to your home but at a fraction of the cost of a traditional brick extension or orangery installation. 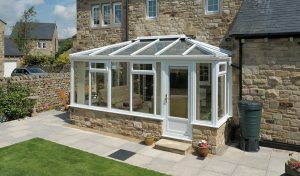 Conservatories also deliver great pay back in terms of your investment. The Royal Institute of Chartered Surveyors suggests that the addition of a conservatory or orangery will increase the value of your property by around five per cent, delivering a fantastic return on investment of almost any home improvement. Premier Window and Doors works with the G12 and G14 National Installer of the Year, T&K Home Improvements to offer a complete range of conservatory options. They’re a really cost-effective way of adding extra living space to your home and now at the start of spring, it’s a great time to add one to your home. We can support you through the whole process from concept design to delivery. For more information, please don’t hesitate to email me on enquiries@premwindowsanddoors.co.uk or call a member of our team on 01296 422 842 or 0800 854 353.